Political consultant of United States Democrats Joe Hansen conducted a Political Campaigns Strategy Workshop with members of the Liberal Party of the Philippines (LP) on November 16 and 17, 2011 and emphasized that elections are about the people and not about the candidate. 70 participants that included members of congress and local officials attended the workshop where Hansen talked about effective campaign messaging. 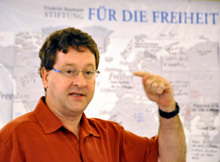 Hansen, who was also in Manila in 2009 to share his experiences during the Obama campaign, noted that politics in the Philippines was changing. “There are people that are getting voted into office mostly because of their character, their positions on issues and their party affiliation. It shows a level of maturity of democracy which is healthy,” said Hansen. Hansen underscored that electoral candidates should be able to provide people with choices and contrasts. He explained that since there are a lot of information sources available, candidates should have a clear and consistent message that should be constantly repeated to create “branding.” The workshop participants strongly agreed with this point and related it to the victory of Philippine President Benigno Aquino III who won the 2010 elections as the anti-thesis of the corrupt government of Gloria Arroyo. Political Affairs Undersecretary Chito Gascon who was the Director-General of LP during the presidential elections, was in high spirits as he reflected on the 2010 campaigns. “I’m very happy that I was part of it. It will always be etched in my heart and in my soul as maybe the greatest campaign I’ve ever been involved in,” expressed Gascon. He also gave 4Ps for candidates to consider when they run for elections: Prayer, Purpose, Preparation, Policy. 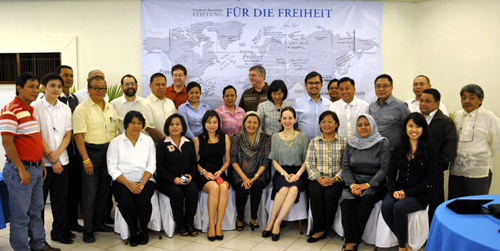 The workshop was co-organized by LP and the Friedrich Naumann Foundation for Freedom (FNF). “As the Philippine electoral process is changing, we thought it would be useful for candidates to step back and reflect on their campaign strategies. Electorates now ask ‘Who are you?’ and not ‘How much money do you have?’ We want to sustain this mood so that the success and credibility of the 2010 elections will not simply be a one-time achievement,” said FNF Country Director Jules Maaten.